State-owned broadcast signal distributor Sentech has defended its continued ownership of a valuable chunk of radio frequency spectrum needed to provide telecommunications services. This is despite the company not using it and growing calls from private-sector operators for it to return the spectrum to its regulator. The spectrum in question, in the 2,6GHz frequency band, is highly sought-after as it can be utilised to provide services using WiMax, the wireless broadband technology, and other wireless systems. Internet service providers and other telecommunications operators are scrambling for access to spectrum to provide consumers with wireless voice and broadband services. Former Vodacom Group CEO Alan Knott-Craig and other industry players have frequently called on the Independent Communications Authority of SA (Icasa) to force Sentech to hand back the spectrum. But nothing has happened, in spite of promises by Icasa that operators that don’t use spectrum allocated to them will lose it. 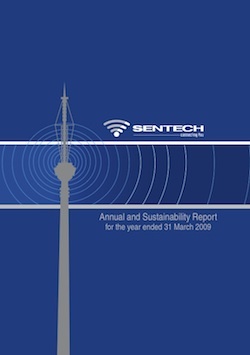 In Sentech’s 2009 annual report, published last week, the company’s chairman, Colin Hickling, has come out in rigorous defence of its exclusive access to the spectrum. “I want to state unequivocally that Sentech intends to utilise this spectrum allocation to filful its social mandate of delivering broadband to underserviced areas,” he says. Hickling’s assurance comes in spite of the failure of Sentech’s prior wireless broadband project, known as MyWireless, for which it squandered hundreds of millions of rand of taxpayers’ money. The company announced last Monday that it would discontinue the MyWireless service in November, as well as discontinue the related VAS and BizNet products, five years after it began building the wireless network. Undeterred, Hickling says Sentech wants taxpayers to stump up another R3,3bn to pay for the roll-out of a new national wireless broadband network. This is in addition to R500m that the national treasury has already allocated to the company for the construction of the network. The R500m has not yet been spent. Sentech has not explained how the new network, which will be built to service outlying and rural parts of SA, will make money, or whether the service is expected to operate at a loss. Hickling says Sentech is in discussions with the department of communications about the additional funding. As soon as it is received — assuming it is received — the company says it will introduce wireless broadband to certain schools, health centres, government offices and post offices nationwide. “[Government’s] national broadband policy, which is scheduled for completion early next year, will hopefully provide valuable guidelines that will encourage collaboration and eliminate the potential for municipalities and provincial governments to establish independent broadband networks,” Hickling says. > “[Government’s] national broadband policy, which is scheduled for completion early next year, will hopefully provide valuable guidelines that will encourage collaboration and eliminate the potential for municipalities and provincial governments to establish independent broadband networks,” Hickling says. Right. So not only has Sentech proved that it’s incapable of providing wireless broadband access, but they don’t want anyone else to do so either?!!! Yes, I had to have a good chuckle at that. They don’t want any competition, even from government. LOL. Sentech should be privatised — sell it to the highest bidder, and then let anyone provide signal distribution services.